NASA's Cassini spacecraft will get its best look at Saturn'sbiggest moon Titan this weekend, when it takes the deepest dip yet into thecloud-covered satellite's hazy atmosphere. Cassini will fly 43 miles (70 km) lower into the atmosphereof Titan than ever before when it swoops past the Saturnian moon in the earlymorning of June 21 GMT (evening of June 20 Pacific Time). At its closest point,the probe will be 547 miles (880 km) above Titan'ssurface. 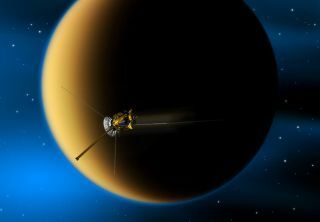 This is one of the most anticipated flybys of the Cassinimission so far, C?sar Bertucci, one of the Cassini team scientists, wrote in ablog post for NASA's Jet Propulsion Laboratory, located in Pasadena, Calif. Theflyby is the 71st Titan pass of the Cassinimission since it arrived at Saturn in 2004. It will be Cassini's first time flying below Titan'sionosphere, the layer of electrons and other charged particles that make up theupper part of the moon's atmosphere, Bertucci wrote. By dipping this low, Cassini should be far enough away from Saturn'smagnetic field to be able to potentially detect magnetic signatures thatoriginate within Titan itself. "We want to get as close to the surface with ourmagnetometer as possible for a one-of-a-kind scan of the moon," Bertucciwrote. The goal, researchers said, is to find out if Titan has itsown magnetic field, which could help scientists understand more about themoon's interior and geochemical evolution. But first, Cassini mission scientists had to make sure itwas safe for their spacecraft to fly so deep into Titan's atmosphere. The atmosphere of Titan applies torque, or rotational force,on objects that fly through it in much the same way that the flow of air pusheson a human hand sticking outside the window of a moving car. ? Cassini's mission planners and the NASA Engineering andSafety Center in Hampton, Va., have analyzed the torque applied by Titan'satmosphere to confirm that the spacecraft can fly safely at its lowest-yet altitudeabove the moon's surface. By coincidence, the engineers discovered that the moststable angle for Cassini to fly was the same as the angle required to point itshigh-gain antenna to Earth. So, by cocking the spacecraft a fraction of a degree, missionmanagers should be able to track Cassini in real-time during its closestapproach. Thrusters will fire throughout the flyby in order to maintain this angleand pointing automatically. Cassini was slated to be decommissioned in September of thisyear, but has received an extendedmission that now runs through 2017.